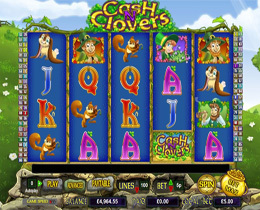 Cash N’ Clovers is a 5 reel and 100 Payline Video Slot. It is a non-progressive game and features a Wild, Scatter, Free Spins with a jackpot worth $5,000. The high quality graphics and sound effects add to the excitement of this video slot which will keep players entertained for hours. The scene across the reels depicts a sun kissed field in the heart of Ireland, and the aim of the game is to discover the Leprechauns’ Gold at the end of the rainbow. Icons included in this video slot are 3 different Leprechauns, a Gold Coin, a Rainbow, a Squirrel, Cash N’ Clovers icons including High Valued playing cards. When any of these icons form a winning combination they will animate. The Gold coin is the Wild, but does not substitute any other icon and does not offer a multiplier either. When the Bonus round is triggered, players will be rewarded with Free Spins or an instant win. When a player has 3 Pots of Gold show up on the screen, he will be awarded with 15 Free Spins together with a 6x Multiplier. 10 Free Spins will be awarded when 3 Leprechaun Hats appear on the screen with a 4x Multiplier. The screen is embraced by two rows of numbers which pay out huge rewards, but a lot more smaller reward that can add up to quite a sum. Cash N’ Clover will suits all players, as the minimum bet is 0.01 up to $1.00 with a maximum bet of $100 per spin.